Crawfish Étouffée for Football Season, Mardi Gras and More! Note: This post is in no way sponsored, endorsed or administered by the National Football League (NFL) or any of its teams. All opinions and views expressed on The Speckled Palate are my own, not that of the NFL and/or any of its 32 teams. Any team names, logos or other symbols referenced are properties of their respective organizations. We are just big fans—and we want to share our love for our teams, the game and the food that brings us all together on game day. It feels like the fall, so we should make Crawfish Étouffée this weekend! This classic Louisiana entree makes a comforting meal for a chilly evening and easily doubles (or triples) to feed a crowd. Peeled crawfish tails cook low and slow with the Cajun trinity — onion, green bell pepper and celery — and other ingredients. Once the flavors meld, the dish is served over rice with green onions and parsley. What’s not to love? We could probably attend an outdoor football game without melting this weekend, y’all. And it finally feels like we can make some more traditional gameday dishes because I always associate tailgate food with the fall. Étouffée is smothered, meaning it cooks low and slow with a small amount of liquid in a covered pan. When done, the “gravy” is served over rice. Étouffée is one of my favorite Louisiana dishes… and I’m partial to it in the fall. During my collegiate years, I ate a ton of étouffée at tailgates before football games. And after college, I have memories of devouring étouffée at my in-laws’ kitchen table on a chilly evening. And I wanted to make that for y’all here. While I’m not a native Louisianan, I lived in the state for years… and I married a Louisiana boy. This recipe, which came to us from Winston’s mother, has been adapted over the years. While it’s not 100% traditional, it’s most certainly delicious. I like to think it’s darn good for a Tennessee girl who’d never tried étouffée before she moved to Louisiana at 18. If you cannot find Louisiana crawfish tails in the grocery store (they should be marked as ‘Certified Cajun’ and a product of Louisiana), purchase shrimp instead. Don’t drain the crawfish before taking them out of the packaging! The liquid mixed in with the tails is the fat. It is essential in this recipe! If you are using shrimp, peel them and season with the same amount of creole seasoning. Add an additional 2 tablespoons of butter into the pan as they cook to make up for the lost crawfish fat. I’ve had luck finding Louisiana peeled crawfish tails in the freezer section of Whole Foods here in Dallas. Perhaps yours has them, too? Low and slow is key. While this dish cooks up pretty quickly, letting it simmer on the stove just brings out the flavor and makes it even more delicious. Festive bowls: We traditionally serve our étouffée in gumbo bowls (like these Juliska Puro Whitewash Cereal/Ice Cream Bowls), but these Roux Brands Ceramic Étouffée Bowls are precious, too! Proper skillet: I love my Calphalon Stainless Steel Skillet with a Cover. This Lodge Cast Iron Covered Deep Skillet would also make this recipe beautifully! Easy serve and clean up if you’re tailgating: Serve this étouffée in Compostable Plant-Based Clear Cold Cups with Biodegradable EcoPure Spoons for a smaller environmental footprint. Now who’s ready for some football recipes? All right. Now who’s ready for some étouffée? Drain the liquid (fat) from the crawfish packaging into a separate small container. Set aside. Remove the crawfish tails from their packaging and place in a medium-sized bowl. Season with Tony Cachere’s Salt-Free Creole Seasoning. Set aside. In a large-bottomed saucepan over medium-high heat, melt the butter and drizzle in the olive oil. When the butter and olive oil are hot, add the flour to the pan. Stir the flour constantly as it cooks, moving it around the pan. It will begin to darken just slightly, and when this happens, it’s time to add the vegetables. Add the onion, bell pepper, celery and garlic to the pan. Cook until tender. Add the seasoned crawfish tails. Lower the heat, and cover. Cook for about 15-20 minutes, stirring occasionally. Season with salt and pepper, green onions and parsley, and cover again. Simmer on very low heat for an additional 1-2 hours. Serve over rice, sprinkle parsley and green onions on top of the each individual serving, and enjoy. This recipe can easily be doubled or tripled for a crowd, though it will require more time to cook. You can substitute shrimp for the crawfish tails if you cannot find crawfish tails at your grocery. Since the crawfish has fat, I recommend adding an additional 2 tablespoons of butter to the dish as the shrimp cook. Have you ever tried étouffée? Would you like to? 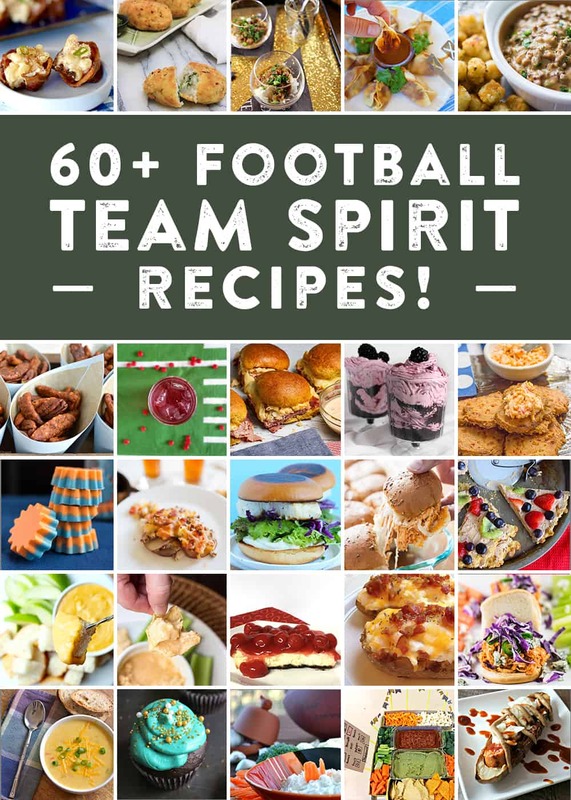 Which of these football-centric recipes would you like to make this fall? Ugh this looks and sounds so so so good. But chicken étouffée? I know a lotta cajuns who’d say no way to that! Looks incredible!! Have to try this recipe! I had crawfish for the first time in New Orleans last year. I love your mini versions! I LOVE crawfish! I have never thought to look in my Whole Foods for frozen crawfish tails but now I am going to do so! I have made etouffee with shrimp before – this recipe looks delicious. Thanks for the tips!